The backyard birds were nowhere to be seen upon our return from Yellowstone. I’d topped off the feeders before we left, but that didn’t last more than a couple of days the way they go through the seed. This has happened before, but we usually see them filing back in within a day or so. Not this time. I tried a new kind of seed in the feeders, which was recommended (“they’ll love it!”) by the guy at the birding store. Still, no action whatsoever. I switched one of the feeders back to the seed mix with the black sunflowers, which had been quite popular. Waited another day. No birds. What is their deal? Eventually, a House Finch stopped by and pecked at some seed, then flew off. The next day a Chickadee checked things out. Then the Mourning Doves. And then all the other regulars started coming back. Now we’re talking. 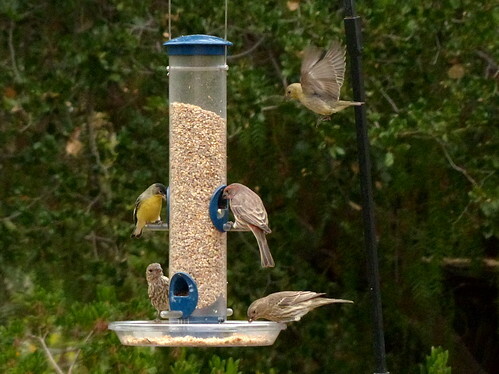 Here we see House Finch and Lesser Goldfinch working their way through the new seed. This mix doesn’t include anything with seed hulls, such as sunflower seeds, so the area below the feeder will be tidier. The discarded seed hulls were building up, but I figured that could work as a thin layer of mulch. I was wondering why the plants below were doing poorly, and then read someplace that sunflower seed hulls can be toxic to many plants. Just another reminder that I have absolutely no idea what it is that I am doing. 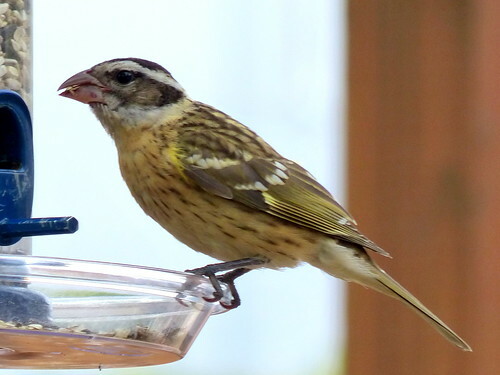 We had a visit at the front yard feeder from a Black-headed Grosbeak, seen in the yard only once before, last April. Our area is in its migration path: it spends the summers in the Northwest, and winters in Mexico. Nice to see that she remembered our feeder and stopped by on her way down south. And it’s a good thing she didn’t stop by two weeks ago. The birds are definitely on the move. We’ve been seeing small formations of Canada Geese heading south most mornings, and the raptors are starting to show up as well. So, unlike the summer, we won’t need to travel to see birds. They’re coming to see us. So I promise to keep the feeders topped off and the bird baths clean, if they need a break along the way. Just trying to keep the customers satisfied.